Yubraj Sharma completed his medical training in 1991, the first 4 years of his career being within various hospital medicine specialities, obtaining the MRCP. 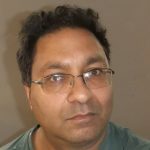 He then trained at the Royal London Homeopathic hospital, receiving his MF.Hom in 1996, and now works as a private homeopath in London, as well as an NHS clinic (Integrated medicine, homeopathy and acupuncture) in the gynaecology outpatients at Whittington hospital. He runs courses in homeopathy and is the author of 4 books: “Homoeopathy of the Solar System: Mercury”, “Spiritual Bioenergetics of Homoeopathic Materia Medica”, volume 1 & 2 and “Spirit, Earth and Human Evolution”.